One medium-size clear plastic/glass ornament. I want to comment on this because I think it’s really important… While yes, you can find the clear ones that literally are 2 pieces that fit together, this ornament looks WAY better if you can find the one that I used. It’s not two pieces, and the way you get the strips of paper in is through the top of the ornament by just popping off the hanger thing (so eloquent, I know). So that being said, I found mine at Michael’s and got it for .79 since it was on super sale or something. They don’t have this specific kind at JoAnn’s I don’t think, and be aware that Michael’s has both the kind that I bought and also the 2-piece ones. Make sure to hunt down the right one, as otherwise it’ll be way more difficult to do this project. 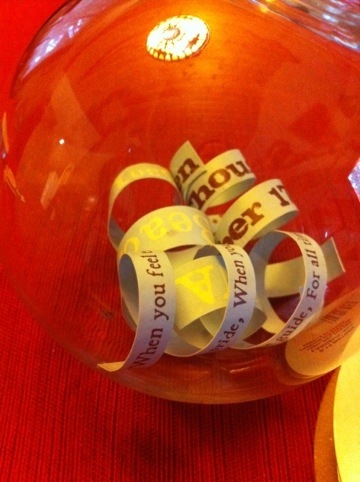 A wedding invitation (or two)… You can also do this with pretty much any invitation to anything! 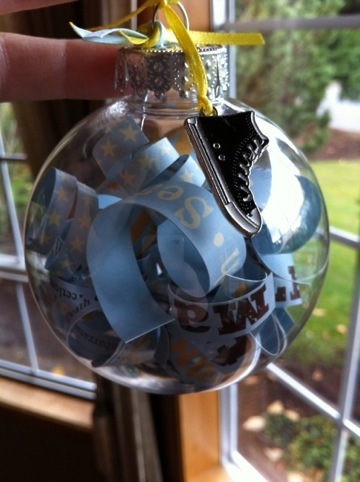 I ended up needing to use a second invitation because I didn’t have enough strips of paper to fill up the ornament. No big deal! Some colored ribbon – I bought two 50 cent spools of thin ribbon at Michael’s in our wedding colors, light blue and yellow. A charm or two – Okay, you don’t HAVE to do this but I really think this just makes the ornament super adorable. I wanted to have some element of our wedding in the charm, so I went with a Converse sneaker. I found mine on etsy for I think like $1.50. 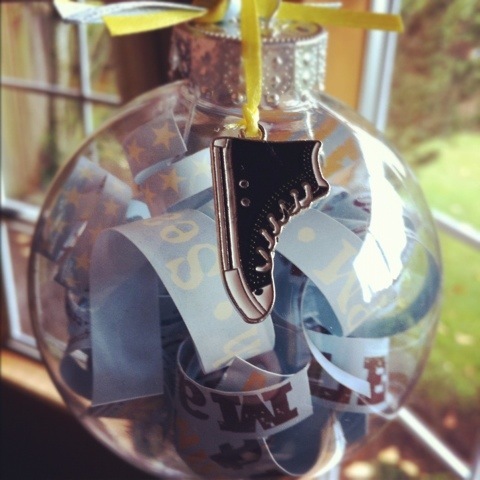 It’s so perfect, so I highly suggest grabbing a charm or two for your own ornament to snazz it up! Scissors – To cut the invitation into strips, and also your ribbon of course! 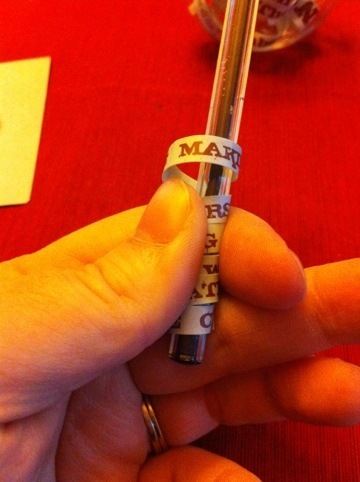 A pen – You need this to twirl the strips of paper around. It gives the strips a perfect curl and works perfect. Step 1: Start cutting up your invitation into strips. 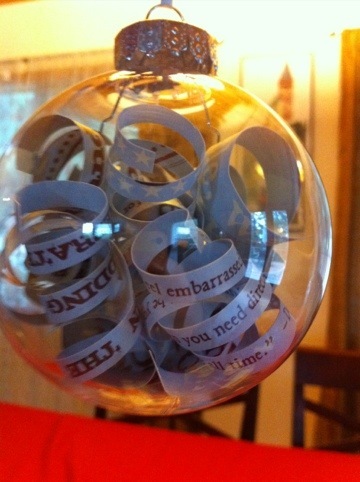 Obviously do this per line, so when it’s all twirled you can look at the ornament and see the text. I ended up having really long strips in certain spots since our invitations were much longer horizontally vs. vertically. Step 2: Once you have your invitation in strips, started creating the curls by taking each strip and curling it around your pen. The end result is a tight curl. 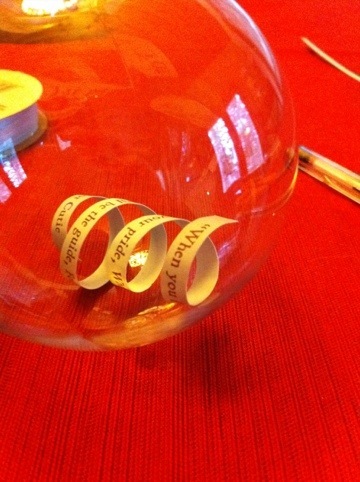 Step 3: Once you have all of your curled strips, start putting them into the ornament through the top hole. Again, you might end up needing another invitation, or if you end up buying a smaller ornament, one might be totally fine! I think some people have added confetti or whatever to their ornament, so feel free to get creative. I ended up just doing the invitation as I wanted it to be simple. Step 4: Once your ornament is completely filled up to your satisfaction, put the top hanger thing back into place. YAY! Pretty ornament. Step 5: Snazz things up by making a hanger with your ribbon, and also feel free to tie ribbon in a little bow on the hanger thing. Make it look as pretty as you want! Step 6: I used ribbon to tie the charm onto it, really simple. You could use string or whatever, depending on how big the hole is on your charm.